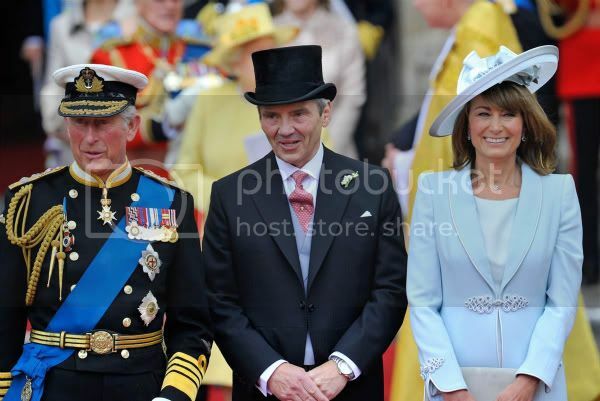 Beatrice and Eugenie certainly look different. Princess Anne looks just like Prince Charles, which is unfortunate. Speaking of Prince Charles, he's aged a lot these last few years. 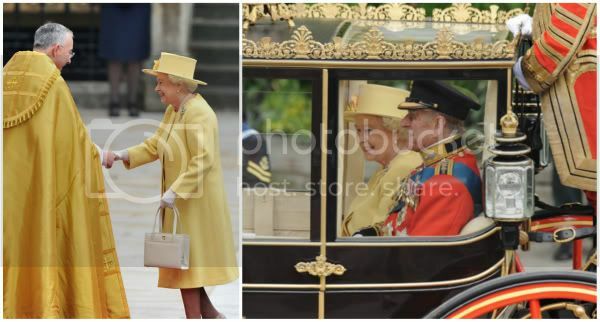 I really liked seeing The Queen in yellow. Everyone in Catherine's family looks adorable and happy. I love the use of color in these dresses. Very Spring and nothing "way out there"... except for that one hat anyway! Princess Beatrice's hat.... can we say Minnie Mouse? Crikey, Prince Charles has really aged. In this photo he doesn't really look much younger than the Queen - and she's 85!! Beatrice and Eugenie - such pretty girls but such terrible fashion sense!! Ugh! The Middletons all looked fantastic, they are one attractive family. 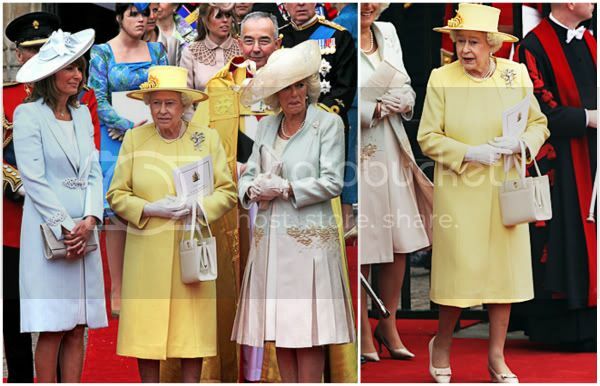 I love the queen in yellow too. Mainly because I love yellow. It is HIGHLY unfortunate that Princess Anne looks so much like Charles. But, her outfit is fun and very spring-timey. 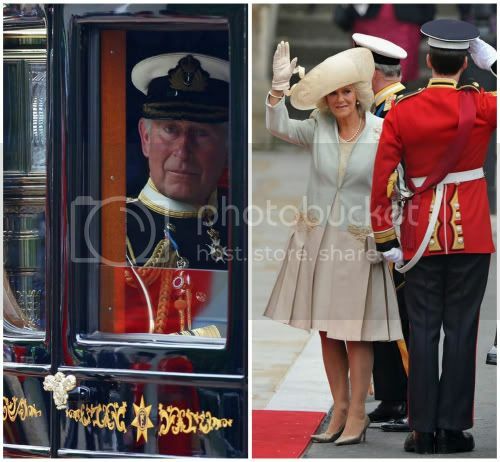 I enjoy the pic of Carol, the queen and Camilla. The queen and camilla look very unhappy to be standing next to each other and poor Carol has that look of "I'll just stand here uncomfortably while you two hate each other". 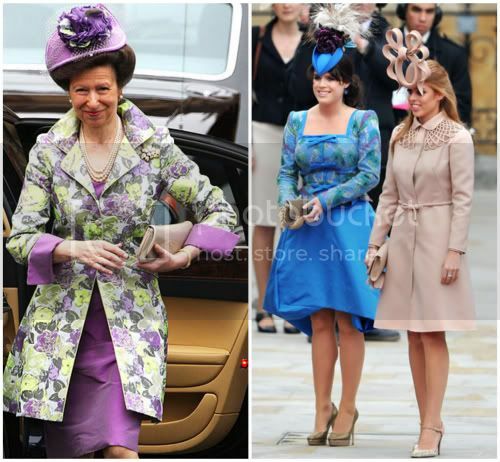 Princess Eugenie & Princess Beatrice.. I keep reading flack about them online, but I loved their looks. Modern + Fun! Such great pictures of the family! The mother of the bride looked fantastic!!! Perfection!!! Princesses B. and E. hideous. Disaster. Wanna be scene stealers. Ugh. The Queen. I loved her in the yellow! So pretty and such a happy color. Camilla looked nice. Nothing to rave about though. That one girl is so pretty so I'm not understanding that stupid hat. There were some really pretty hats there, I don't even think that can be called a hat as much as it was a crazy headpiece. Are those two full sisters?? They don't look alike at ALL. Thank God they got some good looking people like Di and Kate to marry them...dilute the fugly. Anne looks ridiculous, but completely English. Charles does look old, but very distinguished. I thought the outfits and hats were crazy and fun. I was glad that not everyone was dressed conservatively. Even if the result was a little...strange. Prince Charles has aged so much. He's starting to look more like 90-year-old Prince Philip's younger brother than his son. I think Queen Elizabeth's best accessory on Friday was her smile. It was awesome to see her looking so happy. And she does look great in yellow. Unflattering dropped waist and pleats on Camilla's dress. Strictly for the young and slender. Or slender, anyway. And did you see footage of Eugenie trying to walk in heels? Oh, dear. I thought royals were taught to do those things. 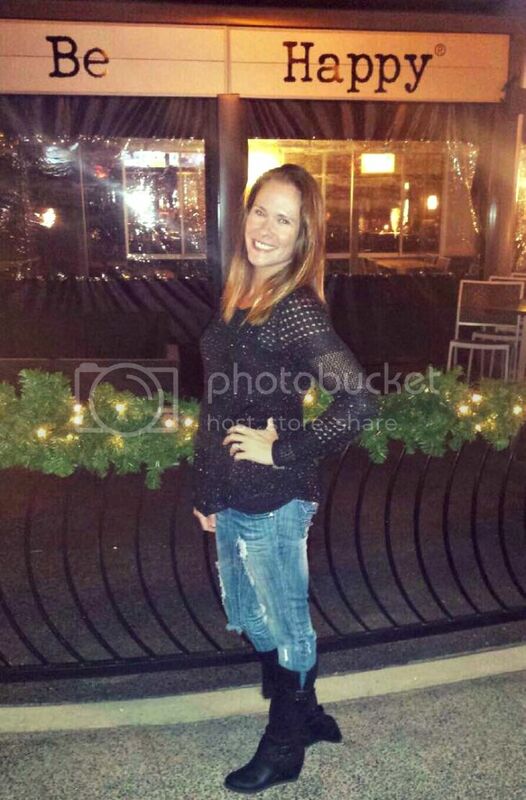 AND, as long as I'm being snarky, some of these people really need braces on their teeth and a good whitening. Can't they afford it? ?